Successfully Added InFocus M560 Android 5.1 Smartphone - Dual 4G SIM, Octa Core CPU, FHD 5.2 Inch Display, 128GB Micro SD Support, 13MP Camera to your Shopping Cart. 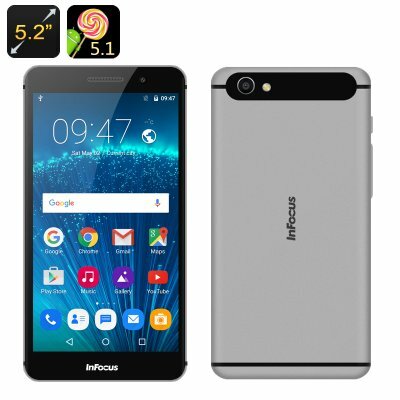 InFocus have released their latest phone to date and the M560. With its full HD screen an octa core CPU and 2GB of RAM this dual 4G SIM Smartphone looks exceptional appealing for its price. The InFocus M560 has a stylish curved edge design with rounded contours an luxurious feeling case that's smooth to the touch and sits comfortably in the hand like its truly belongs there. The M560 Smartphone has been carefully designed with attention to detail so it looks and performs like a dream. Running on an Octa Core CPU with 2GB of RAM brings a high end performance to this hand set and the lush full HD screen is a real eye pleaser, much like the phones silky smooth looks. With 1920 by 1080 resolution the 5.2 inch screen packs in plenty of pixels per inch so you can enjoy movies and games in great clarity with sharp images and splendid color depth. When it comes to navigating the phones great features you can sit back and enjoy the Android 5.1 experience which is a pleasure to interact with. On top of this you get the benefits of a more intuitive device that takes smart phones to a whole new level. Google play will open up a wealth of possibilities for your entertainment and with the 16GB of internal memory and a micro SD card slot capable of supporting 128GB of additional storage even the most avid gamer and photographer will find there's plenty of room. The cameras on this phone are another key feature and offer superb 13MP resolutions as well as 5MP when snapping selfies. With two SIM card slots that each support 4G bandwidths you can manage multiple numbers and take control of organizing business and personal contacts with ease all on this one spectacular device. The InFocuis M560 comes with a 12 months warranty, brought to you by the leader in electronic devices as well as wholesale Android Smartphones..